Odds and ends, junk piles, dirt piles, you name it. Any homesteader will tell you — they come with the territory. Because gardening on a large scale, keeping livestock, and living on a shoestring doesn't always allow for the minimalist approach! 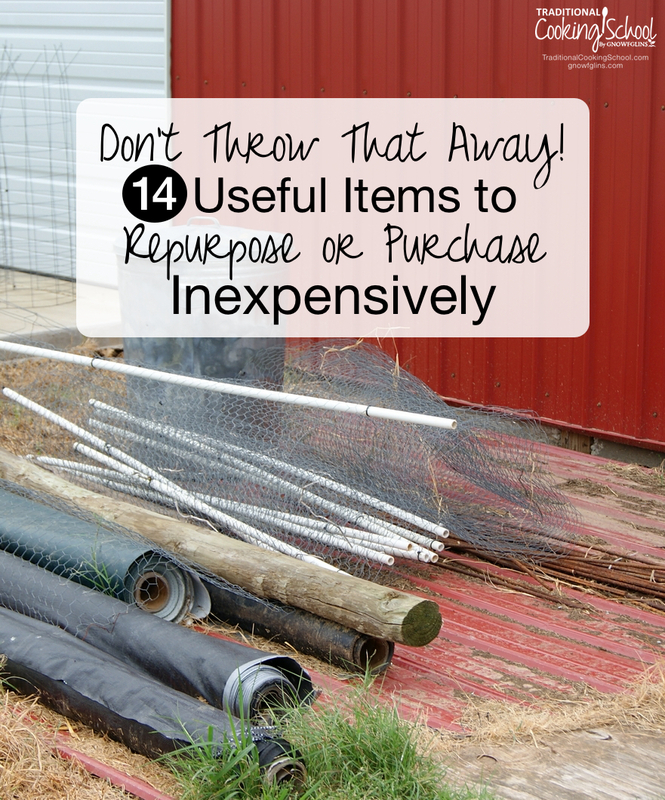 Many times your junk can be saved and re-purposed to stretch your budget and make homestead living much more efficient. Or, if you don't have what you need on hand, many times it can be purchased inexpensively — or located for free! Knee high pantyhose are elastic and lightweight — perfect for tying tomato plants to supports or staking a young sapling tree. They can also protect the stem of a squash from borers. Simply wrap one around, bandage-style, to keep the borers from attacking the stem. Used stockings work fine, but since I don't wear them I purchase them inexpensively at the dollar store and keep a supply in my garden tools bag. Full size pantyhose also works. Just cut the legs to the desired length. We use these to divide the chicken yard or to create a safe place within our chicken run for the different ages and sizes who might not be on friendly terms yet. They help to introduce chickens to each other while keeping the little guys protected. Use these like a dog run, or combined with a dog run to extend the perimeter of the enclosure. I like to use baby gates as a slide-to-one-side “lid” on top of our brooder for chicks. This makes it easy to clean the brooder to tend to a few chicks at a time for whatever reason. Lay the gate on its side on top of the brooder, making sure that all edges of the brooder are completely covered. The unlatched gate will slide easily to one side, allowing for a partial opening. Active chicks will stay inside and curious dogs or other pets will stay out. This is an obvious choice since it provides a multitude of uses, from small construction projects to help around the garden. I've used old boards to quickly erect a temporary chicken shelter to provide shade. I have also used scrap boards to trap squash bugs. In the evening, place a board on either side of your squash plant. The following morning, the squash bugs will have gathered on the underside. They can easily be collected and tossed into soapy water before being added to the compost pile. Scrap lumber also makes a great weight for seasonal garden covering or a floating row cover. It works well to hold down the edges of the row cover, but is light enough to easily remove when it is time to tend to the garden underneath. Along with the scrap lumber, blocks can be used to hold down a floating row cover. If you have any leftover from a construction project, you can also use them to surround a garden bed. Try filling the holes with soil, and add plants inside them for a pretty edge. Cement blocks also work well to elevate a chicken coop (the chickens love to sit inside the holes). We use them to support our rain barrels. These work great as large watering cans. Or, if you have limited garden space you can drill holes in the bottom and use as a planter for large crops such as tomatoes. When not in use, they are great storage containers. We use several to hold our bamboo garden supports upright in a corner of the garage. This may seem like an unusual “junk item”, but we have a large pile on our property that we've used for over three years. The pile itself is an eyesore, and for that reason I have been particularly anxious to get rid of it. It has come in handy on a number of occasions, though. It has functioned as top soil once amended, and fill dirt. You might be surprised at the number of projects that need fill dirt — and how expensive it can be to purchase. Learn to love your dirt piles! If you have any T-posts leftover from a fencing project, combine them with cement blocks to create a stand for your firewood. T-posts will also function as supports for small trees or climbing vegetables such as tomatoes. We save the narrow widths and use them in the garden. They work well as bean poles for climbing vines. They also make a great support for floating row covers. Gently bend them over raised garden beds and clamp to the sides “covered wagon” style. The floating row cover can then be draped across the top for a great instant “greenhouse”. PVC pipes combined with poultry mesh also work well as a trellis (see below). We keep a variety of different sizes and weights on hand. Besides using it in the chicken run we have combined it with re-bar and PVC pipe to make bean/pea trellises. Pound a short length of re-bar into the ground, place the PVC over it, and stretch the chicken wire between the two poles. Secure the chicken wire to the PVC pipe with zip ties (another great item to keep on hand). We also use welded poultry fencing to make tomato cages. Bend the wire fencing into a round “tube” about 4 feet high and secure the edges together with zip ties. Filled with water, gallon jugs can give you a jump start with your tomato plants in the spring. When planting seedlings, surround them with the jugs. The water inside will absorb heat during the day and release it at night. Or, freeze full water jugs, then set in the chicken yard to help keep your chickens cool. We use the disposable smaller sizes to provide the chickens with a pan of ice for the summer. Larger bins can be used to brood chicks or to confine a chicken for whatever reason. Dishpail size can be used as a nest box, and for gathering produce from the garden. Save your cardboard boxes! Collapse and use as a weed barrier in the garden. Wet the area you want to cover, lay the box flat, then wet the box. Cover with mulch or a small layer of soil. What everyday items do you find useful on your homestead? Great ideas. We are just getting started on our homestead, and I’m having a hard time with balancing my desire for minimalism with a need to save items to save money. Watch out for pantyhose in the garden. Dogs like to eat it, and it will make them very sick. We almost lost a dog this way.